The overall topology and interfacial interactions play key roles in understanding structural and functional principles of protein complexes. Elastic Network Model (ENM) and Protein Contact Network (PCN) are two widely used methods for high throughput investigation of structures and interactions within protein complexes. In this work, the comparative analysis of ENM and PCN relative to hemoglobin (Hb) was taken as case study. We examine four types of structural and dynamical paradigms, namely, conformational change between different states of Hbs, modular analysis, allosteric mechanisms studies, and interface characterization of an Hb. The comparative study shows that ENM has an advantage in studying dynamical properties and protein-protein interfaces, while PCN is better for describing protein structures quantitatively both from local and from global levels. We suggest that the integration of ENM and PCN would give a potential but powerful tool in structural systems biology. 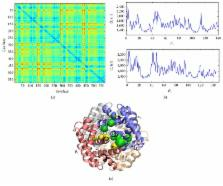 Anisotropy of fluctuation dynamics of proteins with an elastic network model. Fluctuations about the native conformation of proteins have proven to be suitably reproduced with a simple elastic network model, which has shown excellent agreement with a number of different properties for a wide variety of proteins. This scalar model simply investigates the magnitudes of motion of individual residues in the structure. To use the elastic model approach further for developing the details of protein mechanisms, it becomes essential to expand this model to include the added details of the directions of individual residue fluctuations. In this paper a new tool is presented for this purpose and applied to the retinol-binding protein, which indicates enhanced flexibility in the region of entry to the ligand binding site and for the portion of the protein binding to its carrier protein. Large Amplitude Elastic Motions in Proteins from a Single-Parameter, Atomic Analysis. Copyright statement: Copyright © 2017 Guang Hu et al.